Yep it doesn’t work, except where it does. No ones leaving capitalism behind. It’s okay to have a teeny tiny amount of socialism- but the backbone of the economy needs to be 95% capitalist. Social security for the elderly is necessary, workers’ rights are necessary, children’s rights are necessary. What is not necessary is spreading the wealth, and taking it from someone who is a hard worker and successful, and giving it to someone who abuses the system and claims that they are unable to work when in reality, they can. (programs such as the EPA need to be shrinked). I think that qualifications for SSDI, Medicaid, and other socialist programs should be tightened. Too many people as it is can fake disability and such in order to take advantage of the system. Pure socialism might work for smaller countries, such as those in Europe, and countries with a small population such as Canada, but I don’t think it’ll work in the U.S. Socialism also leaves a country vulnerable to corruption from the top down, and inside out. OP, how do you feel about Social Security, Medicare, Medicaid, driving on an interstate highway, as well as police and fire services? We need some good old fashioned Milton Friedman up in here. Sell off the National Parks… if people want them then they would be willing to pay for them out of their own pocket… if they don’t then they aren’t forced to. When does it work for a country with similar characteristics as the U.S.? That sell-off-the-parks’ justification is transparently stupid. The people who want there to be national parks don’t see it as a thing of “willing to pay for them”. This isn’t effective againstone particular response I’ve seen. You know what I find extraordinary? They don’t want ranchers grazing, but they have no problem with those stupid ATVs or what ever you call them. Sweden’s not populated by human’s? People are starting small (and large) businesses every day by the thousands and tens of thousands. 627,000 per year. Nobody is trying to stop that. All this talk of socialism is a lot of bullsqueeze. Can we get a “Socialism” subforum? 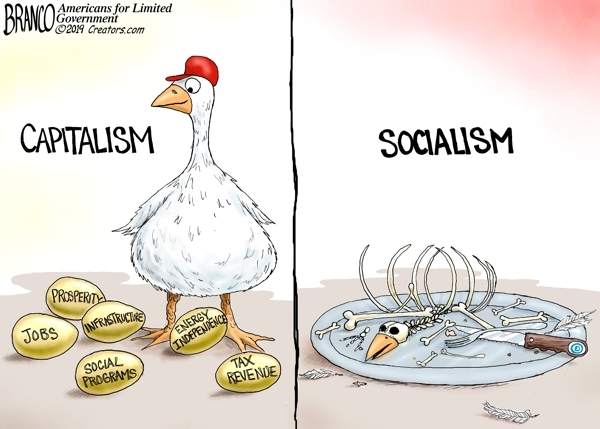 How many socialism posts, all virtually the same fire and brimstone/chicken little/sky is falling variety, do we need?